Stenciling Curtains is an Easy and Affordable Way to Embellish Your Windows! We’d like to introduce Jessica, the clever DIY blogger behind Decor Adventures. Recently, Jessica decided to give her master bedroom a makeover. She put together a list of projects to complete the transformation and first on this list was new curtains. She wanted a unique and custom curtain look that would add a little pizzazz to the room. 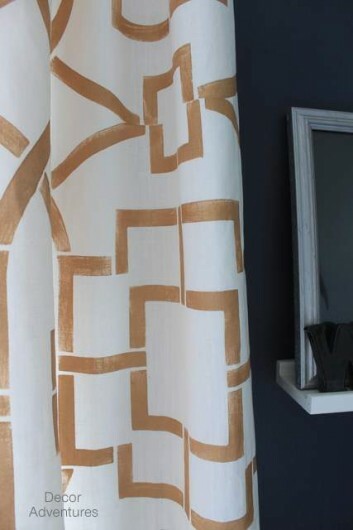 Rather than purchase pricey designer curtains, Jessica decided to create them herself using our Tea House Trellis Allover Stencil and fabulous metallic gold paint. Stencil Brush <— We prefer the one in this link. 1. Gather Materials: Start the stencil project by gathering all of the materials listed above. If it’s needed, iron the curtain panels to remove any wrinkles. 2. Secure The Stencil: Find a flat surface to complete your stencil process. Jessica used two large folding tables. First, she put down a plastic tablecloth on the tables and secured it with tape. Then she placed the curtain panel on top of the plastic tablecloth. Position the stencil design on the curtain panel. 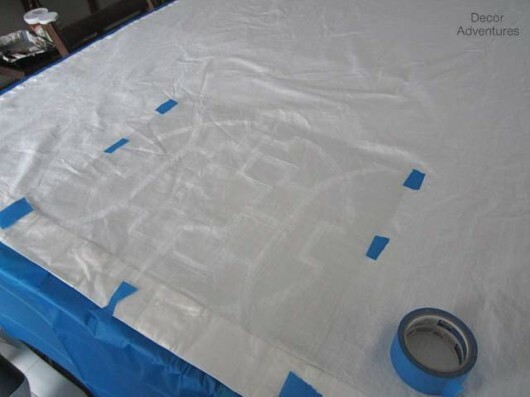 Then you can secure the stencil in place using painter’s tape. 3. Start Stenciling: Pour your craft paint onto a plate or paint tray. Then dip your stencil brush into the paint and blot off the excess paint onto your folded paper towel until the brush looks almost dry. It is key to use as little paint as possible when stenciling. Too much paint will cause the design to bleed and smudge. 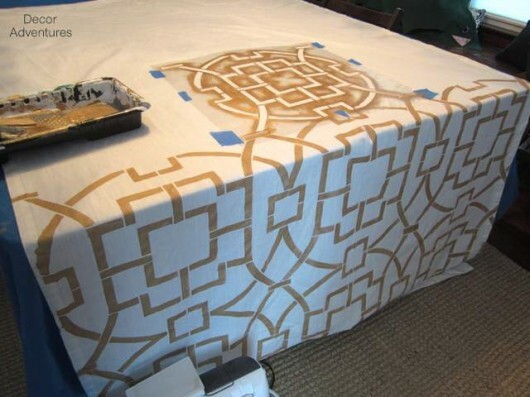 Next you will paint the design onto the curtain panel with the stencil brush. 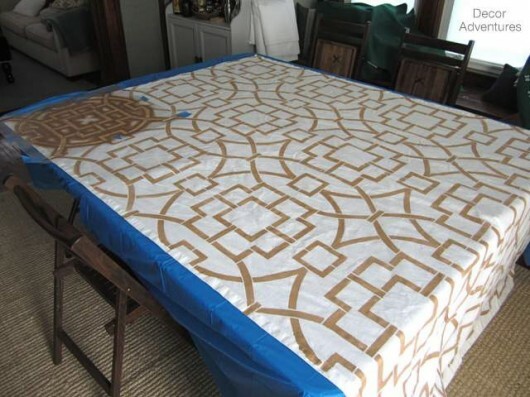 For this project, Jessica used a paint similar to Martha Stewart’s Multi-Surface Metallic Craft Paint. 4. 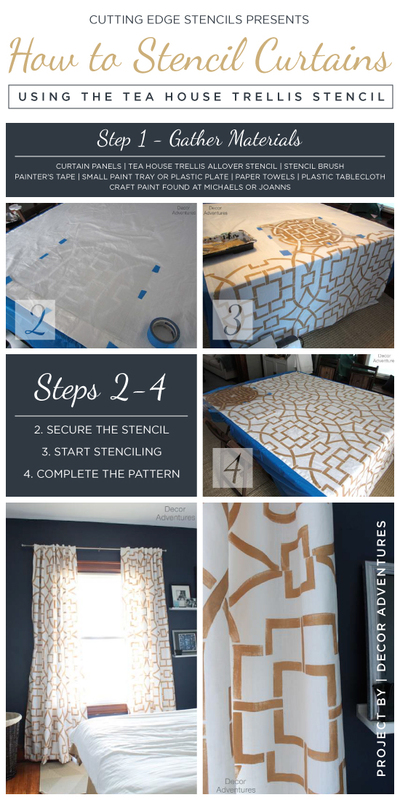 Complete the Pattern: Allow the paint to dry a little and reposition the stencil so you can continue to paint the pattern on the entire curtain panel. Let the paint dry for about two hours before hanging the curtains. Are you ready to see Jessica’s gorgeous curtains? Here they are hanging in her bedroom. She says, “I love how the pattern came out, the gold paint looks great against the white and the pattern is one of my favorites.” We think they look absolutely awesome! Oh, and be sure to check out Jessica’s blog. She’ll be spilling the beans on how to make a liner for her DIY curtains. 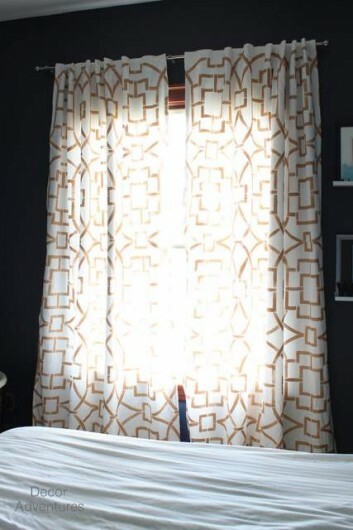 Tell us, what do you think of the idea of stenciling curtains? Leave us a comment below. Shop our stencils and find the perfect one for your curtain project! The Best Ikea RAST Hack Ever Using Stencils!